I finally finished my redo on this little table I picked up for a dollar. I am going to call it my little experiment. Remember how it looked when I first brought it home? You can read about that little story here. I sanded first then painted. I used leftover paint and a staining mixture of vinegar and steel wool for the legs. I mixed my free-B paint from Lowe's with leftover white paint from my daughter's bedroom redo. If the piece of furniture I am working on is small I like to turn it upside-down and paint the legs first. This way you can cover the entire leg. After the legs are dry I flip it over and paint the rest. I sanded the edges of the legs. I used the Pavement color first on the front where the embellishment is. It is a very dark color almost black. I wiped most of it off with a damp cloth & left some in the corners. Then I went over it with the Gray color to lighten it up. The Gray has blue undertones which gave it a nice layered look that I really like. Next, I dabbed & brushed the Burnt Umber paint on the legs and the top of the table. Just certain parts hitting mostly on the edges, then I rubbed it in with my rag and wiped it with the damp rag. I kept doing this until I was happy with the look. Next, I dabbed the crevices of the legs with the Raw Umber paint. I did the same for the top. If you try this, don't worry the acrylic paint wipes right off. You don't need to cry or you can if you have to. I did a couple of times. Just kidding! Beautiful transformation! I am inspired by your creativity. You did a great job! It helps to take your time and get the effect you want. I don't paint....so I can say that! heehee! Love your rusty find, too. I need to go thrift shopping while we are up there....maybe tomorrow! Hugs! This looks amazing Julie! Great find:). Thank you so much for linking up each week to our party!! I love how this table turned out!! 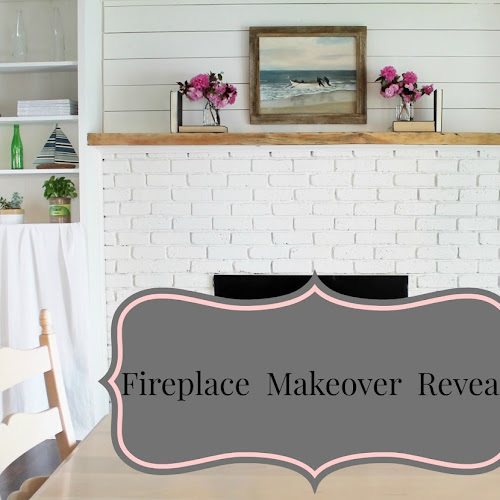 Thank you for linking up at my Furniture and Paint Party! Great Redo!! I like all the colors that come through. Thanks for sharing on DIY Sunday Showcase! !